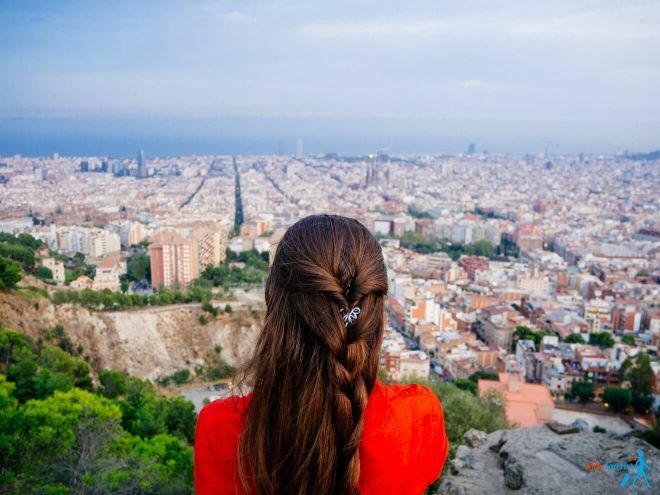 If you have visited all the main attractions in Barcelona already, it is time to hit the road and go explore the surroundings with the best day trips from Barcelona, Spain! What if I tell you there are there some equally awesome things outside of Barcelona? After spending many months in Barcelona city and its surroundings, I must confess – you should spend at least a day or two to visit some of the great attractions outside of Barcelona and avoid the hustle and bustle of the big city! You won’t regret it a bit! Some extremely beautiful cities close to Barcelona are Figueres, Cadaques, Sitges, Lloret de Mar and more, which you will discover in the article below! The awesome attractions I am going to talk about are close enough to Barcelona to make it a day trip and none of them are crowded. Ok, except one of them, but I will share some precious tips on skipping the line there, too! Montserrat mountain is a one-of-a-kind mountain and its “personality” is defined by serried rows of peaks that resemble rounded needles or fingers. 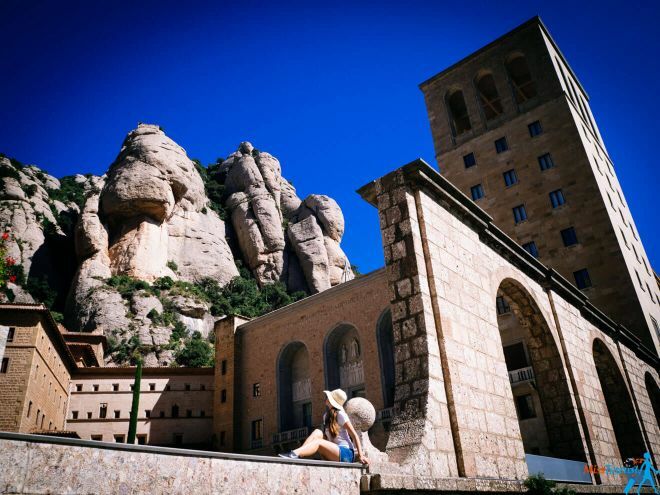 Montserrat would make for a great, short day trip from Barcelona! It is unique not only because of its geology but also because of the ancient Montserrat monastery that is nested at the base of the mountain (the literal translation is “Serrated mountain”). In the monastery, you can see the shrine, the Black Madonna and the boys’ choir singing the Virolai (held daily at 1 PM). there are some great places to eat and chill outside with an amazing view. 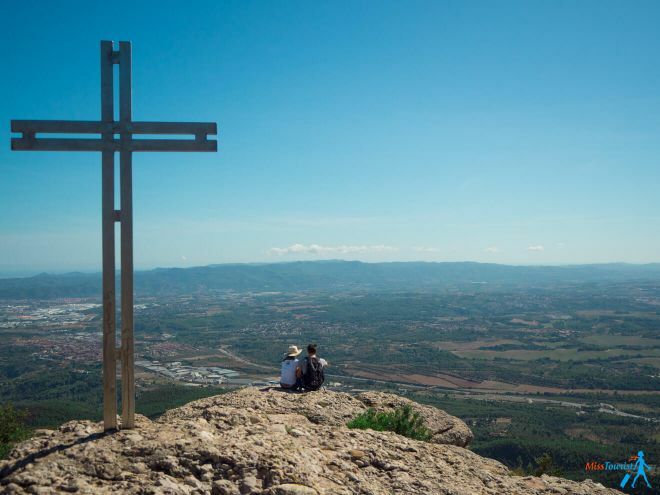 Another option if you want to visit Montserrat – especially if you like wine – is to sign up for this highly-rated Montserrat and Wine tour – and this is actually one of the most easy day trips from Barcelona as well! Leaving from central Barcelona early in the morning, you travel by coach to the abbey, where you get a guided Montserrat tour (in a group of 15 people maximum) of the church, before having two free hours to explore the nearby scenery. During your Montserrat day trip, you also have a chance to hear L’Escolania Boys Choir sing, which is quite a unique experience! Afterwards, you will enjoy a large lunch in the grounds of Oller de Mas castle and winery, before taking a tour of the vineyards and then enjoying a three glass tasting session in the small medieval castle. Choose your preferred ticket and buy it at the train station at Placa Espanya (or you can buy it online in advance following the links above). If you decide on buying your ticket at the place, please come 20 minutes or so before your train departure, the availability is not an issue as tickets do not have assigned seats. Check the updated schedule of trains from Barcelona to Aieri de Montserrat in advance here. The trains come about every hour so it would be a pity to miss it. There are a ticket counter and a ticket machine, you can choose any of them to buy your tickets and cards are accepted too! By the way, the return metro ride between any metro station and Plaça Espanya is free of charge if you chose “Trans” or “Tot”. 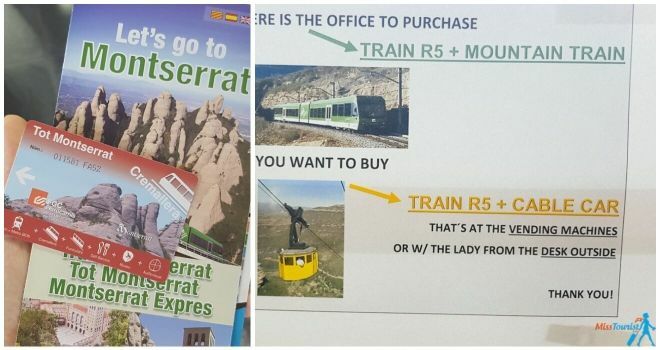 Choose which type of train you want to take to Montserrat – Cable car OR Rack Railway to go up the mountain (I will explain the difference below). Once you reached the place, you can take unlimited rides on funiculars there! In short, all of the three options above provide transportation to Montserrat; some are more expensive because of the extra perks they provide. Which Montserrat ticket did I choose? I chose TOT Montserrat (TOT means “All” in Spanish), and I can say it is definitely worth the extra 18€ – the lunch buffet was delicious and unlimited (you will get hungry during the day, trust me!) and the museum was fantastic too! Tot and Trans tickets are good for any day; there is no specific date on them when you purchase it. This is good as you can change your mind and go a day earlier/later if it is raining, for example. Cable car or Rack railway (Cremallera)? Do not repeat my mistakes, read this part very carefully and you will save yourself some money! 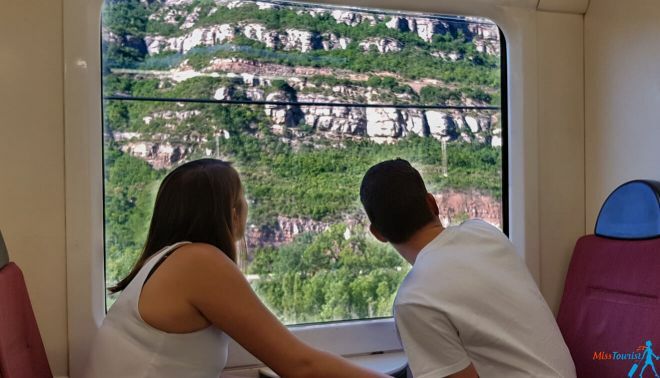 When you board the Montserrat train on Placa Espanya, there is just one train that goes to Montserrat, so everything should be clear until now. But in order to get up to the mountain, you need to get off the train at some point and then take either Cable Car, either Rack Railway. Here is the schedule for both of them just in case (but you will probably not need it as the schedule of the cable cars is aligned to the arrival time of the train from Barcelona). Depending on what you choose, you will need to get off in different stations. Because the companies that provide the service of bringing you up to the monastery are private, they don’t really care if you got off one station earlier/later by mistake. If it says in your ticket that you chose Rack Railway, you have to go with the Rack Railway (Monistrol de Montserrat stop, the second stop of Montserrat). If you made a mistake and you got off at the first station (Montserrat Aeri) with your Rack Railway ticket, you will either need to pay extra for the Cable Car ticket (around 7€ per person one way), either wait for the next train (in 1 hour) from Barcelona to ride one extra stop. I found this part very frustrating – I and many other travelers got off at the first stop by mistake, but our ticket said we chose Rack Railway. We could not waste one hour waiting for the train, so we had to pay the extra 7€. So, which one to choose at the end? Having tried both of them, I can say that Rack Railway (Cremallera) is better as it is more comfortable and you can sit down. IMPORTANT: It is also good to choose Rack Railway because on the way back you will board the train back to Barcelona first (those who chose Cable car option will join the train 1 stop later). Most of them will probably not find an empty place anymore, while you will be able to enjoy your seat for the whole duration of the ride. 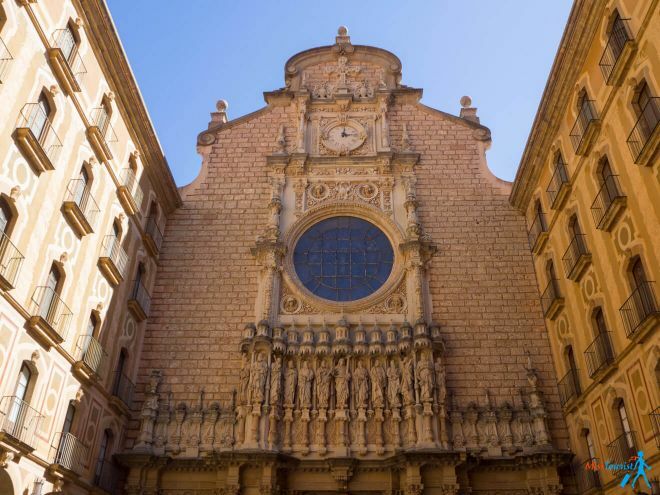 NOTE: If you got TOT Montserrat ticket, make sure to visit Museu de Montserrat, it is such a great museum! Keep in mind that it closes at 5.45 PM (and at 6.45 PM on weekends and during summer), so I would suggest arriving at least 45 minutes in advance. The museum features some great works of Dali, Monet, Picasso etc., so there are plenty of great paintings to see! The audio guide is 2,2€ and I recommend taking it. If you do not want to take a guided tour, make sure to pick up a free booklet in your language, as it has detailed information about all the main objects in Montserrat. Food in Montserrat – There are restaurants where you can order food or snacks. If you take TOT tickets, all-you-can-eat lunch with a great variety of food will be included with your Montserrat trip. If you do not want to buy TOT Montserrat, you can buy the launch separately – it is 15€ per person. Transportation inside Montserrat – If you decide to take a Montserrat from Barcelona tour, you should know that there are two funiculars to take from the monastery, one goes up, the other one down. When you take the funicular up, I recommend going back by foot, it is a charming hike of about 50 mins – 1 hour that you will most definitely enjoy! Hotels in Montserrat – You can stay in Montserrat overnight, there is a hotel called Abbat Cisneros, but it is booked months in advance. Book your stay here! 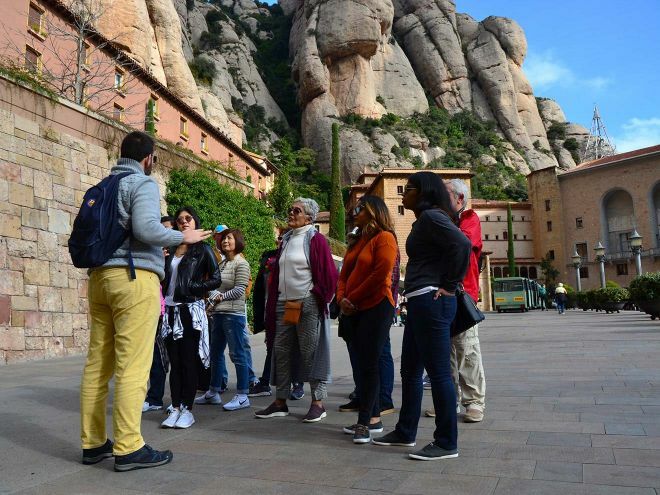 If you want to avoid the lines and crowds, how about taking this exclusive early access tour and meeting the sunrise in Montserrat? You will have a live guide and you will have the place pretty much just for yourself. Seeing Montserrat in a tranquil atmosphere must be an incredible experience, I wish I knew about this option before! You will finish the tour just in time before the hordes of tour buses will arrive. In case you want to see Montserrat mountain from a whole new perspective, then you should take this intimate Montserrat hot air balloon ride that also includes a tour of the Monastery! If you would prefer to see all the main attractions in Barcelona – Sagrada Familia, Park Guell and Montserrat – in a small group with skip-the-line access, then this tour is the perfect option for you! 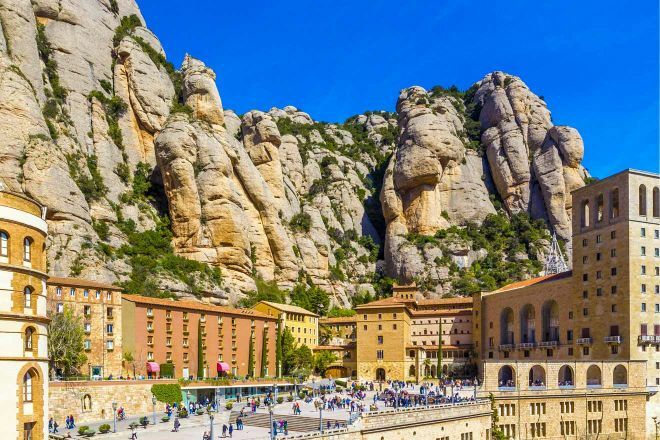 Another unique option would be to take this tour of Montserrat in the evening, listen to the choir and spend the night there and then admire the incredible landscape early in the morning! This tour includes the hotel and half board meal as well. If you are a Dali fan searching for interesting day tours from Barcelona, I have good news for you! 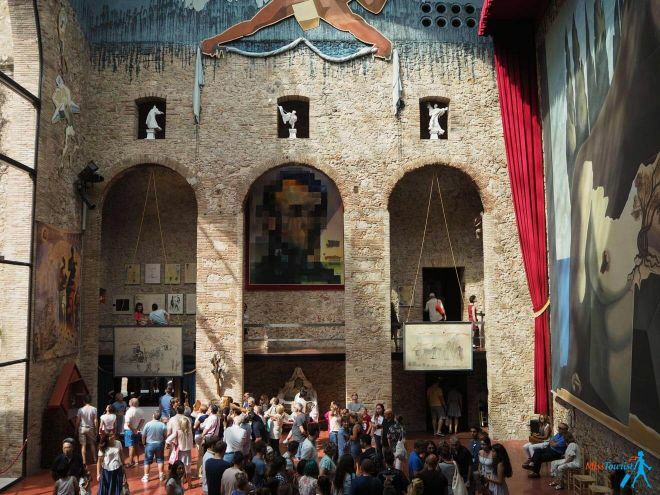 The Dali Theatre-Museum in Figueres attracts thousands of visitors daily and it is the second visited museum in Spain after Prado in Madrid! 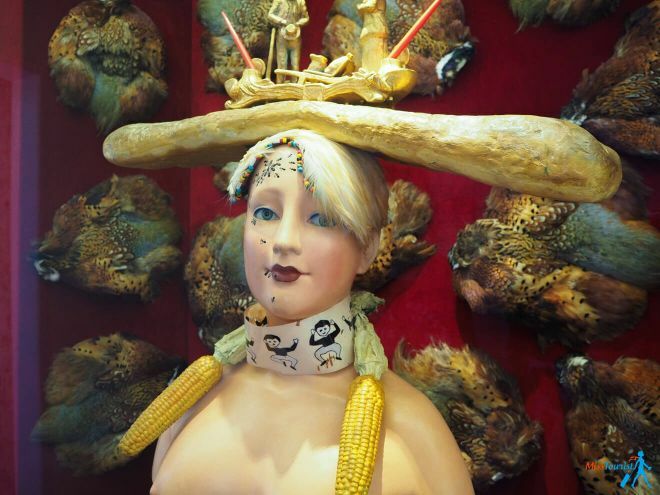 No wonder why – Figueres is the birthplace of Dali and the place where he was buried, too. 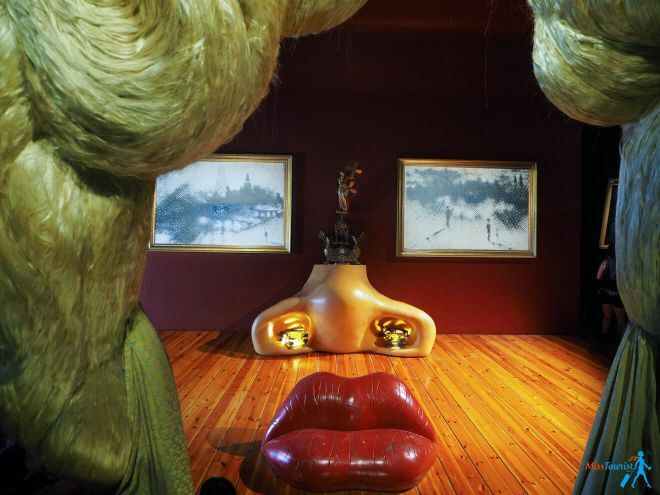 Museo Dali is actually the largest surrealistic object in the world! For this reason, I highly recommend booking a guide in advance. After all, you are going to one of those cool places near Barcelona, you wouldn’t want to miss on any important information, right? Unfortunately, there are no live guides that can be hired at the places, nor audio guides to rent. I was really disappointed when I realized this because you really do miss out on a lot of interesting information if you just look at all the bizarre things! I overheard some information by sneaking in a guided group and in 3 minutes I learned so many interesting facts, that I can only imagine how much I’d know if I would have taken the tour. For example, I learned that Dali married a Russian woman Gala who gave him his inspiration, I learned the meaning of hanging huge condoms in the hall and many more things that I would never understand by myself. One other big advantage of taking a tour – you will be picked up from your hotel, so you do not need to worry about transportation. So convenient, right? 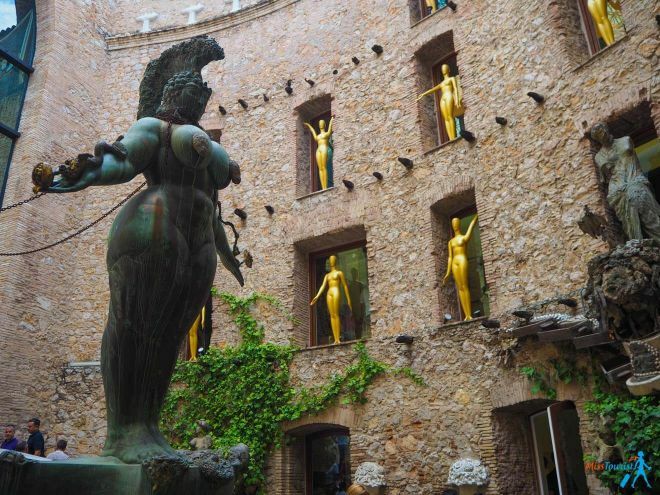 This is a semi-private (small) full-day tour of Salvador Dali Museum in Figueres that also includes a visit to Cadaques (below in this post), a visit to Dali’s home in Port Lligat and more! 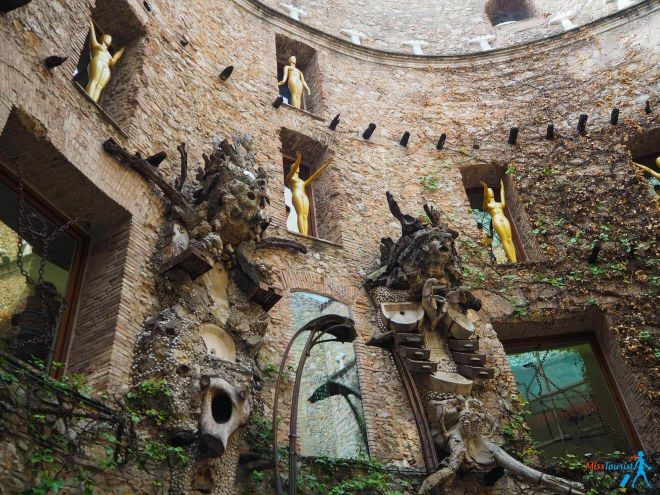 This Figueres and Girona tour with Dali Museum included in another great option, too! NOTE: There are some day tours that offer guided tours, but they actually only provide the guide for the outside of the museum, which loses the whole point of taking a guide in my opinion. So read the reviews carefully before booking your tour. The ones I mentioned above have a live guide for sure. If you do not want to take a tour, you can easily get there by train (a 15-20 minute walk from the train station will be required though), bus or by renting a car. Train. A high-speed AVE train (Alta Velocidad in Spanish) will take you from Barcelona to Figueres in just 50 minutes and will cost about 35€. The train leaves from Passeig de Gracia station, here is the website where you can see the schedule and prices. There is also a normal, no high-speed train, the price is usually 16€ and it takes 1 hour and 40 minutes to get to Figueres train station, so 2 hours all together with walking to the museum. You can also take a local bus from the train station, it will get you directly to the museum for 1,25€. Bus. There is also a bus from Barcelona to Figueres. The good thing about taking the bus is that it stops right in front of the museum, so you do not need to walk, but I would not recommend this option as taking the bus appears to be more expensive and takes longer than a train. Check your dates on the official website, but it will be around 20€ and it will take 3 hours. Driving. Renting a car can be quite a cheap option actually, I recommend you checking the prices here! The journey is 140 km long. Take AP7 motorway and take the Figueres exit. The entrance to the museum is 14€ for adults and 10€ for students. Kids aged 8 and younger can enter free of charge. If you get a Barcelona City Pass (which gives you Skip-the-Lines access to Sagrada Familia and Park Guell), you will also get a 20% discount to Figueres museum. RELATED READ: Barcelona Passes – Which One Is Worth The Money And Which One Is A Rip-Off? The whole visit can be done in a single day, but even half a day should be enough if you are in a rush. 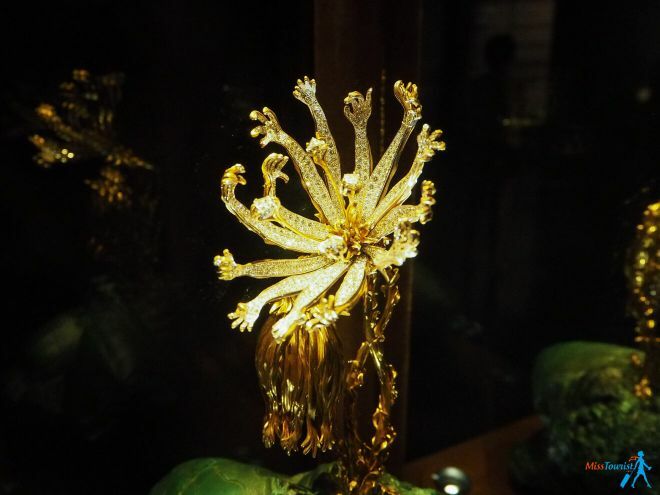 Do not miss the Dali Jewels Museum located just after Dali Museum; the entrance is included in your ticket! 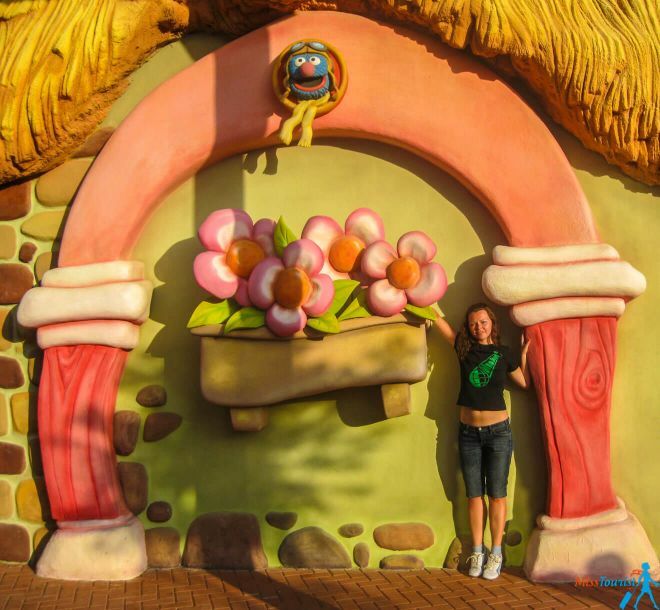 Also, go around the building to see the surreal façade with giant eggs on top! 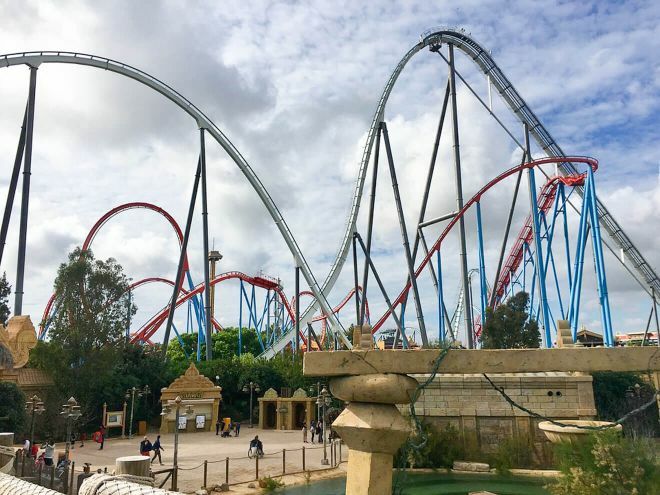 If you are tired of Barcelona sightseeing and want something more exciting for your vacation, maybe a trip to PortAventura theme park would be a great idea, especially if you are traveling with kids! 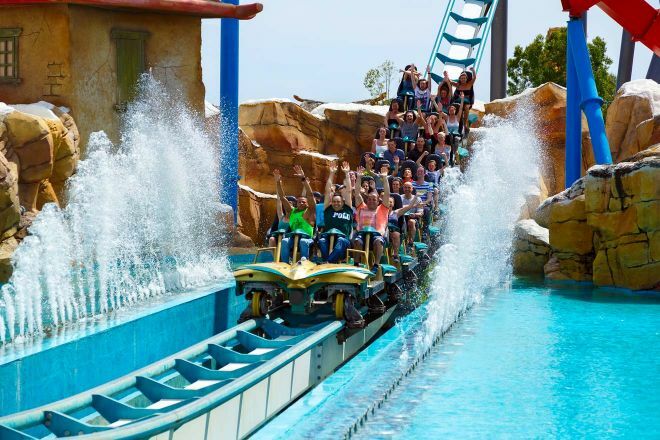 PortAventura Park is a great place for both travelers with kids and groups of adults and it is actually one of the top day tours from Barcelona that you can do! There are rides for all ages and thrill-tolerance levels, so it is definitely worth it to add it to your itinerary as well! Some great PortAventura rides are the crazy Dragon Khan and the legendary hyper coasting Shambhala, and don’t forget about the Tutuki Splash – a volcanic explosion for the entire family! 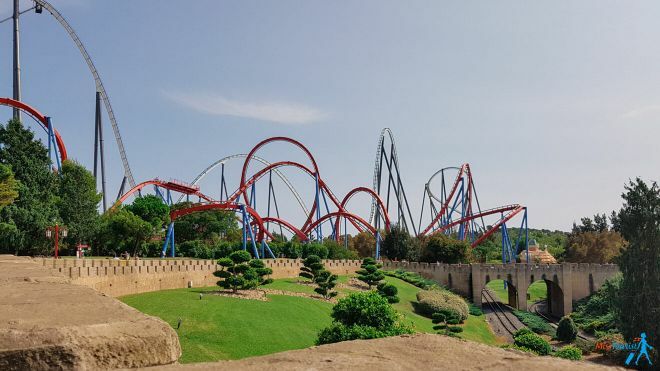 How to buy cheap PortAventura tickets? Do you want to know a secret on how to buy tickets to PortAventura cheaper than on the official website? The price of a single ticket to PortAventura only is 48€ on the official website and the ticket for 1 day 2 parks is 55€. 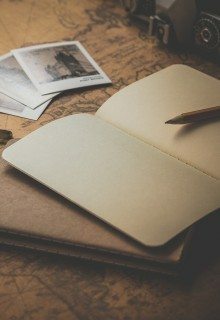 At the moment when I was writing this article, I found cheaper tickets on the GetYourGuide website for 35€ (instead of 48) for 1 day one park. If you want to go to Ferrari Land too, you should buy tickets INSIDE Port Aventura, as there it will be 15€ instead of 20 (with no lines! ), so the total would be 50 (35+15)€. This way you will save 5€ per person if you go to both parks and 13€ per person if you only go to the main park. The offers change constantly, so you can check if there are any current discounted options here. NOTE: I DO NOT advise buying tickets at the gates because the lines are usually horrifying. Why not save some money and time by buying your ticket online? You don’t even need to print it, showing it on your smartphone is enough! UPDATE: You can get a 20% discount (which means about 11€ saving per person) with your Barcelona City Pass (that will also give you free skip-the-line admission to Sagrada Familia, Park Guell, and many other perks)! Fast pass Port Aventura: It costs 33€ to skip the line to each ride once or 53€ for unlimited rides. You can also pay an additional 5€ to be the first in the queue for Express pass holders. I bought one for 33€ and I found it to be enough and I was really happy we decided on this extra investment, it was definitely worth the money! The queues for Fast Pass holders are really not that long, so no need to pay the additional 5€. I have visited it at the beginning of September, but it might be worse on weekends or during Barcelona holidays in summer. Ferrari Land Park – is it worth it? 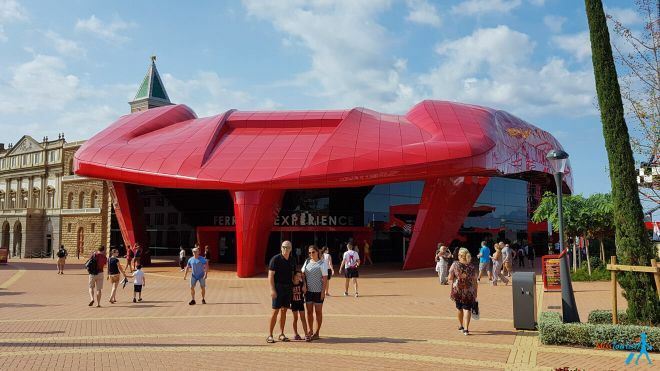 Just like Disney Studio in Paris, PortAventura has a smaller neighboring theme park called Ferrari Land (obviously dedicated to the masterpiece of Enzo Ferrari) with some newer types of ride experiences. I would say it is definitely worth visiting the Ferrari theme park as well! Flying Dreams – Around the world with Ferrari (the one on the right). 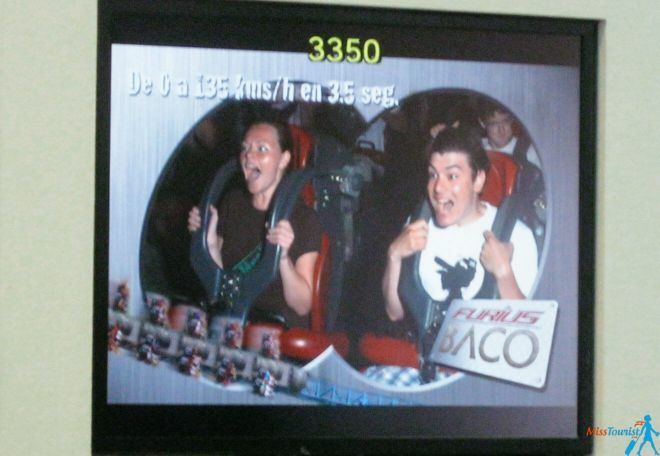 A 6D experience in the coolest ride simulator I have ever been to! It was so beautiful and the level of reality is beyond fantastic! This is definitely my favorite non-thrill ride ever! Red Force ride – This Ferrari World roller coaster is 112-meters high; it accelerates from 0 to 180 km/h in just 5 seconds! PRO TIP: If you buy tickets to Ferrari Land inside PortAventura park, the price will be 15€ instead of 20, which is a nice save! Fast Pass Ferrari Land: I love skipping the lines and this is why I love Fast Passes! They are so worth the money, especially in the hot season! Fast Pass for Ferrari Land is 20€ and yes, the lines can be long. We bought it and we had no regrets! PortAventura is located 100 km away from Barcelona city center. You can get there by train or by bus, but the second option will take longer. I, for instance, took a train. The price of the train ticket can be anywhere between 9 to 13€ for a one-way trip. Thus, the final price for your PortAventura 2 parks ticket will be about 75€ per person depending on which train ticket you buy. The trains leave from Barcelona Sans station. It takes about 1 hour and 20 minutes to get to your destination and it is free seating. A bus might be an option only if you go to the adventure park straight from the airport. You can see the schedule here, but I have to warn you that the buses depart every 2 hours and the price is 30€ roundtrip. Renting a car is always a great option if you drive. You do not need to depend on the train schedule – plus, there are some really great options out there! 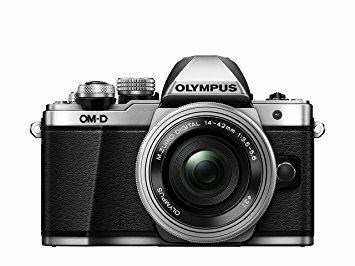 Check out this link to see the current offers! PRO TIP: Take some food and water with you. This will probably not be enough for the whole day, but it will save you some money. Do not forget your sunscreen as well! You can download the PortAventura App to make sure you do not miss a single ride! NOTE: You can combine the visit of Tarragona (below in this list) with the adventure park, as they are located very close to each other. If you do not want to hustle with all those different tickets, you can buy all the tickets and train ticket in one click here and it will be even cheaper than buying it individually (68€ instead of 75 if you would buy it one by one). Known as the capital city of the Catalonia region, Tarragona is one of the most popular destinations in Spain, especially for people who are looking for breathtaking historical and archaeological sites to delve in. Ramble around Tarragona Rambla. 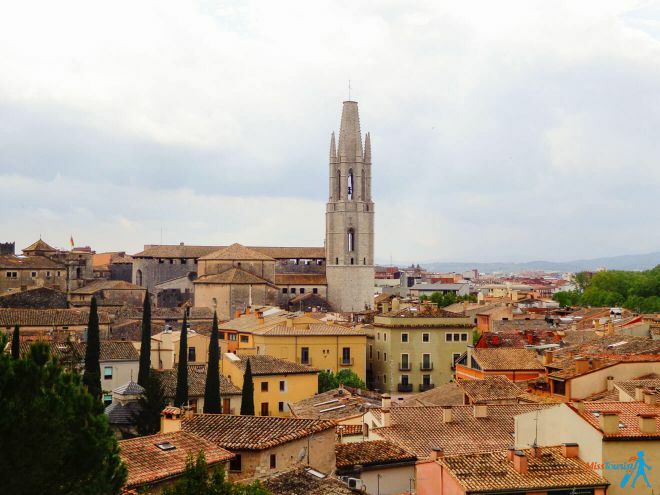 To kick off your day in Tarragona, I would highly recommend for you to ramble around Tarragona Rambla or La Rambla Nova. This is the heart of the city where you could simply enjoy the time of your life strolling and people-watching along with the locals. While you visit Tarragona, be sure to also appreciate the absence of buskers, the array of street arts, historical monuments, and sip on some good coffee in its well-kept cafes. Enter into the time machine of Tarraco ruins. Like many ancient sites, the ruins of Tarraco remains inhabited, but a lot of tourists and locals alike go there because its archaeological ensemble is “one of the largest archaeological sites of Roman Hispania” that is still preserved in Spain up to this day. Here, you can turn back time through some Tarragona sightseeing at its Roman walls, The Amphitheatre, Early Christian Cemetery, The Circus, Aqueduct, and Triumphal Arc de Berà, to name some. 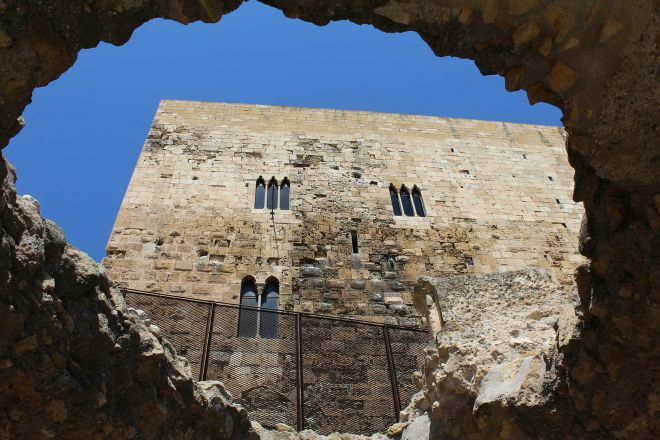 And yup, you guessed it, the archaeological ensemble was declared as a World Heritage Site by UNESCO in 2000! What a majestic sight to behold! Chew on its gustatory food. Of course, your tour in Tarragona won’t be complete if you don’t get to taste the food offerings of Tarragona. The city is rich in seafood, Catalan cuisine, eel dishes, pig trotters, frog legs, and huge fruits and vegetables! There are many options to eat in but I suggest for you to try La Capital, La Andaluza LC de la Part Alta, Txantxangorri, La Fàbrica, Koop, Ithaca, and El Complet. To get to Tarragona, take a train from Barcelona. Travel time is about an hour. Fare ranges from € 7.48 to 24.94 (USD$ 9 to 30). For train schedules, click here. 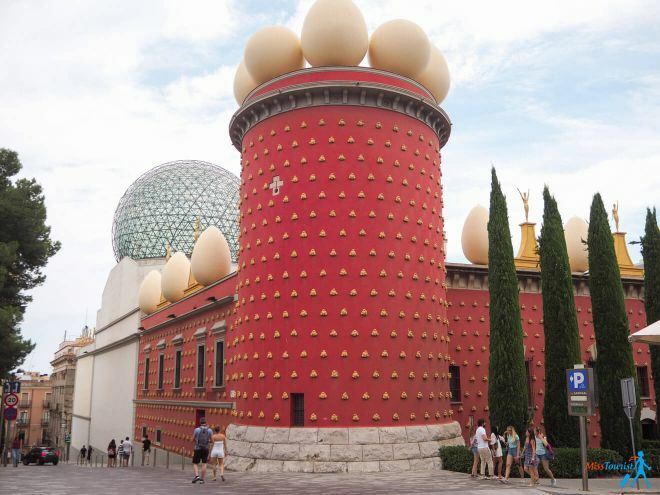 Pay a visit to Casa Salvador Dalí. One of the prominent artists who made a mark in Cadaqués is painter Salvador Dali who lived and worked here for 50 years. This is why you should totally visit his house during your Cadaques day trip! Explore his maze-like seaside house, his works of art, and the fancy eggs he installed on his roof, among other things. Keep in mind though to secure your admission tickets in advance because they sell out fast. For more details, click here. After wandering around the Dali house in Cadaques, I suggest for you to have some adventurous taxi boat tours around the cape! Indulge in pesto pasta and some tapas. For a generous serving of the meal, head on to La Gritta and indulge in some pesto pasta, pizza, sardines, and even ice creams while enjoying an unobstructed harbor view. After which you could spend some time people-watching at the hipster terrace bar of Bar Mut with tapas in your left hand and a glass of mojitos in your right! Explore Cap de Creus Nature Reserve. This spot promises scenic hiking routes, bursting vegetation, cliffs, coastlines, and even underwater worlds for you to dive in. 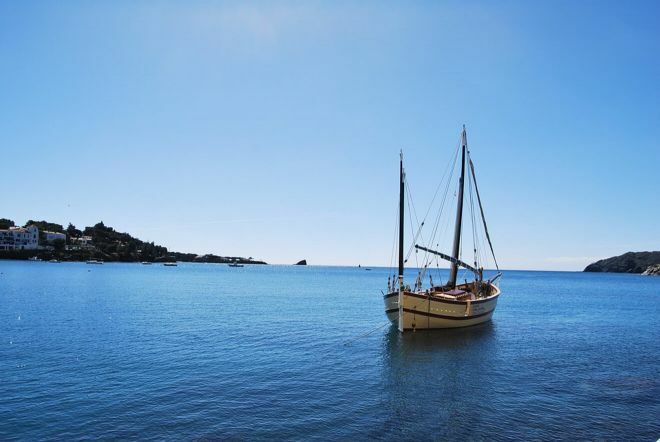 An adventure spot that you shouldn’t miss while you’re in Cadaqués! 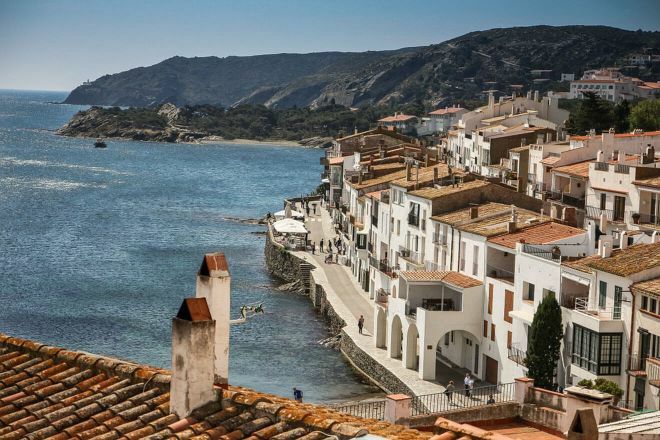 To get to Cadaqués, prep yourself up for a train and a bus ride. Go to a train station in Barcelona that travels to Figueres via regional train service. From there, get a ticket in an orange and black kiosk that costs €16 (US$ 19.24). Double check if your ticket will take you to Figueres. Travel time is two hours. From Figueres, walk to the bus station for two minutes. 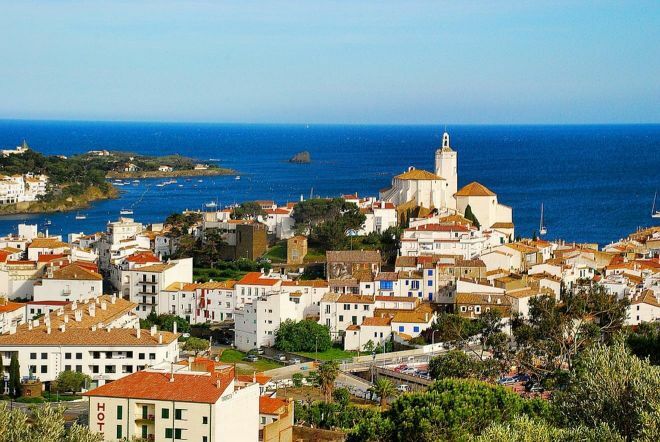 Get a ticket to Cadaqués that costs €5.50 (US$ 6.61). Travel time is one hour. Be sure to stay awake; the road is packed with scenic views! For more train details, click here. For more bus details, click here. Are you searching for some of the most beautiful beaches near Barcelona? 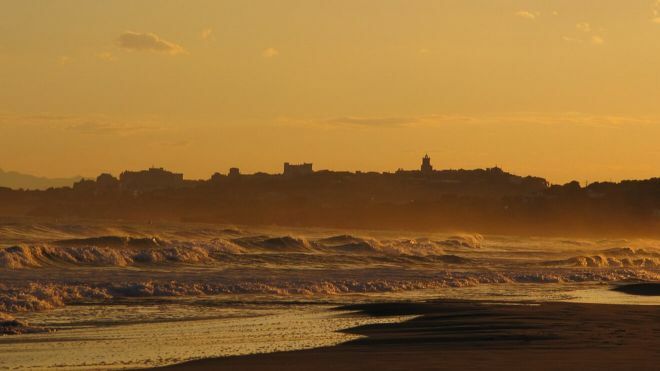 The province of Sitges on the southwest side of Barcelona is your perfect answer! 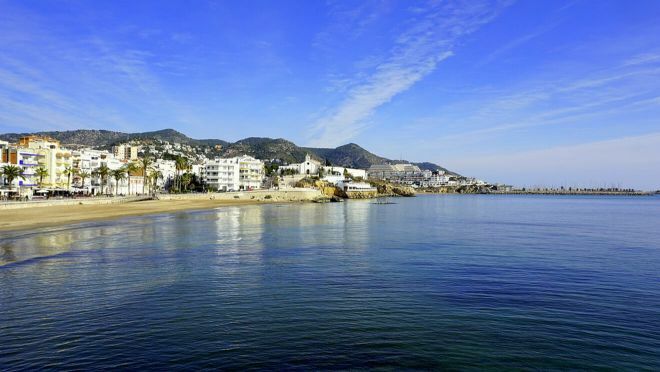 Sitges is blessed with a number of beaches that families, couples, and tourists flock in to have some fun under the sun, keep their children entertained, and relax from all the workloads! It makes sense why so many people choose to have a one day trip from Barcelona to Sitges! Join the vintage car rally. If your feet happen to take you on a Sitges day trip in March, then you are lucky to witness the International Vintage Car Rally. The private-owned glamorous cars paraded and displayed on this event are dated back to 1920s. Feast your eyes on the glossy finishes, huge headlights, and wheels, and unleash the Rose DeWitt Bukater of Titanic in you as you watch the cars in front of you! Dine in, the Sitges way. The best restaurants to take refuge in after a long day full of exploration and relaxing on a beautiful Sitges beach are Fragata, Cafe Roy, and Esmarris. Go to Fragata for a mouthwatering serving of Bacalao confitado, to Cafe Roy for some tapas, and to Esmarris for Catalan feast. And don’t worry, don’t hurry, these three have ambiances like no other! Gulp on some Bacardi. Yup, the maker of the world-renowned drink came from this humble province. While you’re here, visit Facundo Bacardí Massó’s house and learn about his origin, how rums are distilled, how to make your own mojitos, and a lot more! This is a great way to end your Sitges holidays! For more details, click here. 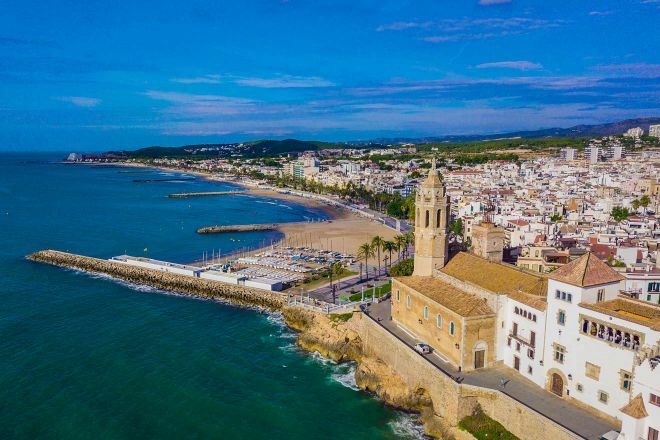 If you don’t want to just lay on the best beaches near Barcelona, you also to discover Sitges with a live guide, this private 5-hour tour from Barcelona is a great idea! 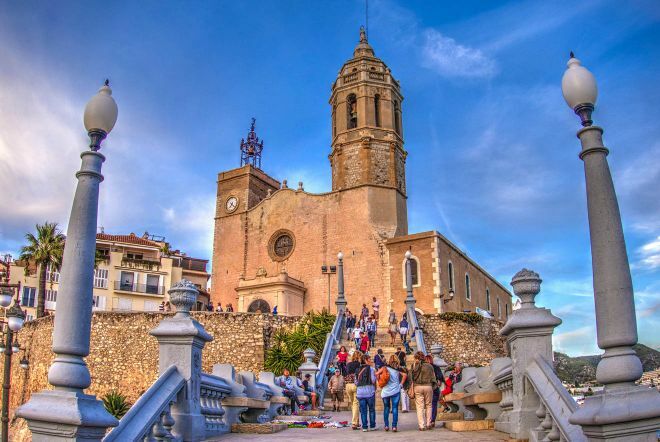 To get to Sitges, you may take a taxi, bus, or train from Barcelona. By taxi, you would need to travel for about 40 minutes. The fare is €75 to €85 (US$ 89.48 to 101.41). By bus, you can either hail a MonBus in Plaza Espanya or in Ronda Universitat on daytime. Travel time is from 45 minutes to one hour. Ride buses with numbers N30, N31 or N32 in Plaza Catalunya at night time. Travel time is about 35 minutes. Single-journey fare starts from €4 (USD 4.77). For bus schedules, click here. By train, ride in any of the train stations Estacio de França, Passeig de Gracia and Estacio Sants going to Sitges. Alight in either Vilanova i la Geltru or St. Vincenç de Calders. Single-journey fare starts from €4.10 (USD 4.89). Travel time is about 40 to 50 minutes. For train schedules, click here. I will not say much about Lloret de Mar in this post, as I already have a dedicated article on this beautiful city! I will just say that it is very underrated. It is considered a destination for party animals, but it doesn’t have to be so. I guarantee you will spend a wonderful vacation with your family, as a couple or in a group of friends. Lloret de Mar is also a great place where you can explore the nature around Barcelona, so it is definitely worth a day trip! I have spent 4 days there and I really liked some hidden gems of this coastal city! 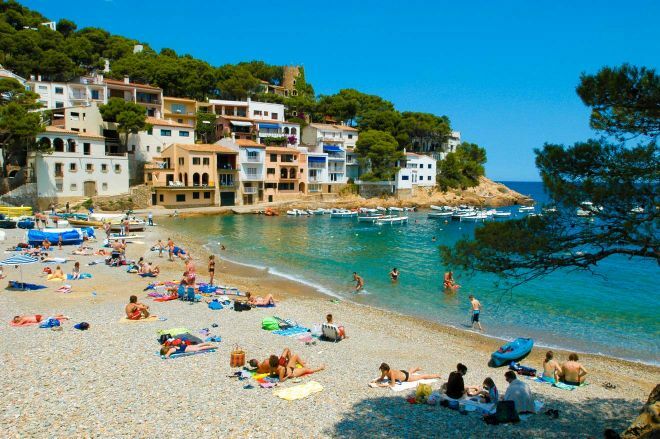 TIP: If you want to visit Lloret de Mar in a more extensive tour, I suggest you take this Costa Brava half-day tour from Barcelona! Experience Ciutat Antiga (Old City). Any good Girona day trip must start in the heart of the city, in the Old City. 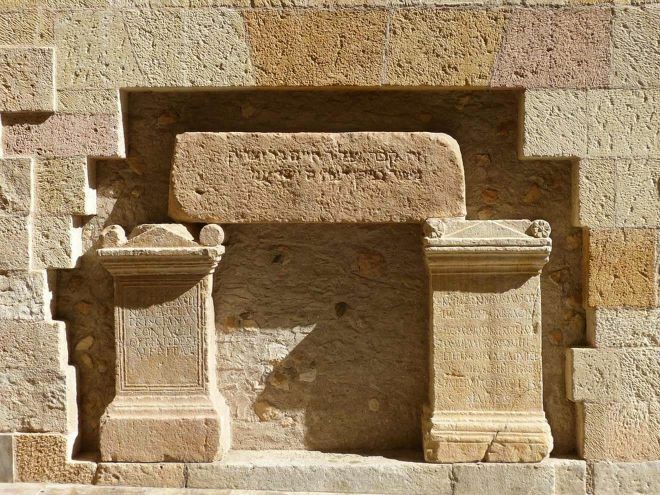 Found here is The Call, the 13-century Jewish quarter that is considered as one of the most important sites in Spain. Find out about its history and enhance your Instagram feed with its adorable staircase and the vibrant Lego-like Casa Maso with a view over river Onyar. Have a feast at a Michelin-starred restaurant. Girona is home to El Celler de Can Roca, the second-best restaurant in the world in 2016. Have a feast on their avant-garde and heritage recipes that will give an unforgettable experience to your taste buds! Marvel on the glorious Girona Cathedral. This one is clustered with tourists because of its nave. It is a single one and it’s said to be the widest Gothic nave in the world! The cathedral has notable Romanesque and Renaissance finishings for you to marvel on, among others. For more details, click here. To get to Girona, take a ride on the non-stop trains from Barcelona to Girona. Depart from Barcelona Sants station. Travel time via regular AVE trains is about 40 minutes. Fare ranges from €9.40 to 31.30 (USD 11.30 to 37.65). For train schedules, click here. 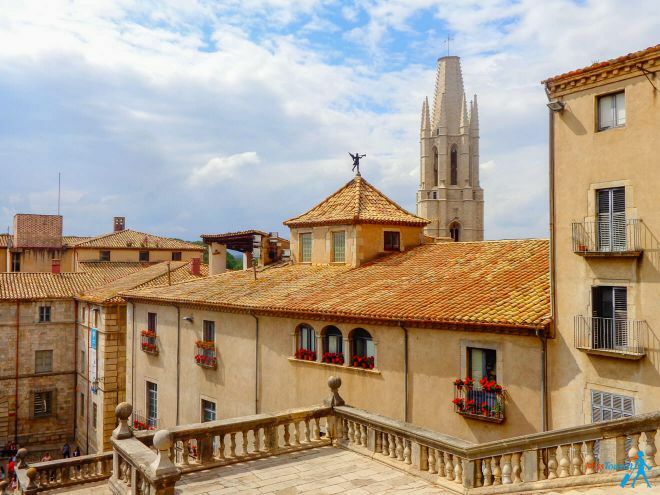 If you are a Games of Thrones fan and you really want to make the best out of your Girona experience, there is a great Girona tour dedicated to that! 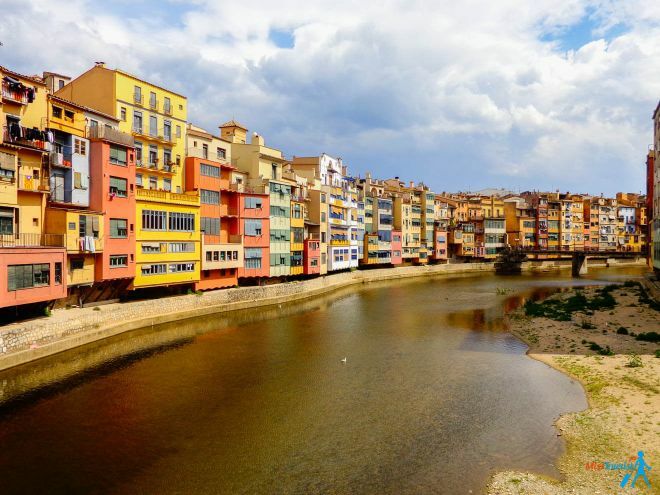 There is also a normal 6-hour Girona city tour from Barcelona that you might enjoy! 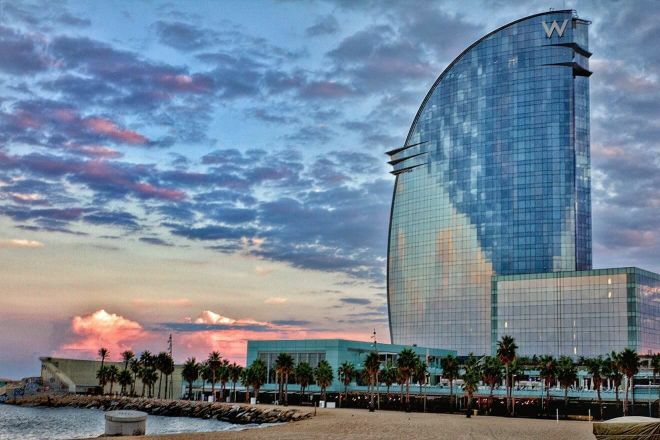 Vic is a welcoming city near Barcelona where dynamic coexists with history. 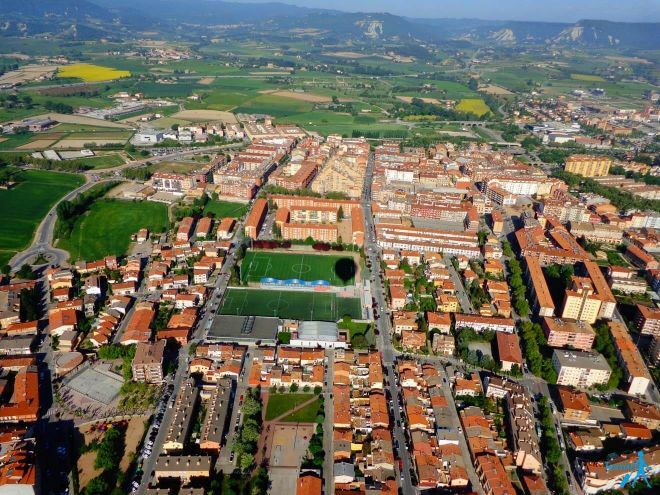 How does it sound to take an air balloon flight over a medieval town? I bet none of your friends have pictures and memories like this from Spain, do they? The balloon flight was a magical experience for me! I described the prices and how to get to Vic here. The city is quite close, about 40 mins by train from Barcelona! 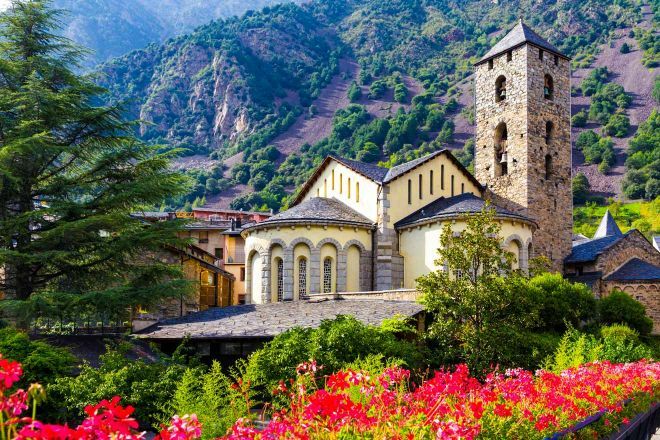 Andorra can also be done in a day trip if you really want to, but you will hardly be able to enjoy it – you will spend most of the day on the road rushing. I would not recommend doing it. Instead, you could rent a car and enjoy one of your best 2-3 days weekend getaways from Barcelona, stopping on the road to admire the nature. Andorra is worth a bit more time than one day if you ask me! Begur is another super nice idea if you are wondering what to do around Barcelona and would like to have a destination all to yourself! Plus, this tiny city has some unique Cuban vibes, with beautiful colonial houses If you wish to go there, I suggest you visit the historical center with Begur Castle (dating from the 11th century), as well as the beautiful pebble beaches, where you can relax and unwind! Again, the best idea would be to rent a car and explore the entire area! If you are a wine fan, then you must include a day trip to some Cava Vineyards in your Barcelona itinerary! Cava is a special type of Spanish sparkling wine that you should taste during your Spain vacation. Even if you are not a wine fan, this activity can be enjoyable for everyone, especially if you are going there with some friends. A great place to do this is Alella and I recommend taking this wine tour by electric bike from Barcelona. If you would like a longer tour, I recommend this 8-hour wine & cava tasting in Catalonia from Barcelona. Barcelona can serve as a great base to discover all the suggested places. Luxury (US$ 300 and up): If you are a football fan, Hotel Sofia, which is a five-star hotel is the perfect choice for you as it is located 5 minutes away from the famous Camp Nou stadium. It offers wonderful rooms designed with a keen eye for details in a modern way which will make you feel right at home. Another five-star hotel is Alma Barcelona GL, which features elegant decorations, a spa with an indoor swimming pool, a sauna and a gym. A nice feature of this hotel is the indoor terrace, perfect for rest and relaxation after a hard day of sightseeing. Middle (US$ 100 – 150): Vasanta Hostal Boutique is a wonderful establishment which features nicely designed rooms, in neutral tones, and has a shared lounge. Coffee shops, restaurants and a lot of pubs can be found within walking distance of this accommodation option. Another good option is Hostalin Barcelona Passeig de Gracia which is one of the best accessible hotels in Barcelona city centre and it has been reviewed by its past guests as clean and an overall perfect choice. If you fancy wines, you will be delighted to hear that it is situated right above vinoteca Torres! Budget (up to US$100): Rodamon Barcelona Hostel is situated right next to the Palau Robert Gardens, so if you fancy nature and visiting the surroundings, this is the perfect budget choice. Another one on my list of the best cheap hotels in Barcelona is Ten To Go Hostel, which offers a shared daytime area and even a pool. La Pedrera is located 2.8 km from the property and if you are traveling by train, Ten To Go Hostel is perfect, as it is located very close to the main train station. Even if the city of Barcelona is stuck in your mind, there are so many amazing things to see and tours around Barcelona, that you MUST leave at least a day or two and do a day trip! Barcelona makes a great base to explore surroundings and I hope my tips made it easy for you to navigate to a place of your interest, be it Girona, Tarragona, Sitges, or any other places that I am recommending above! Regardless of which Barcelona day trips you will choose for yourself, I am sure you will have a great time! 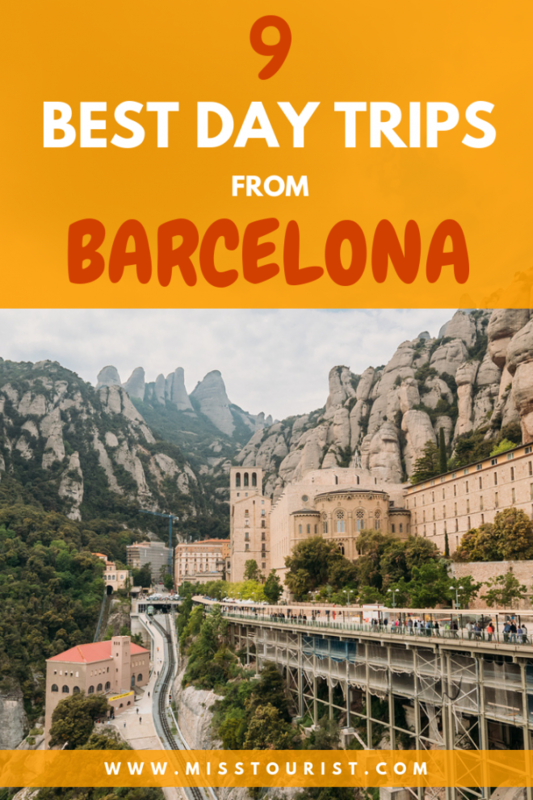 I hope my list of the great getaways from busy Barcelona will help you make your vacation better and I also hope my tips will make it easier for you to get to your favorite place and enjoy your time there! Would you add anything to this list? What do you want to visit out of these 9? As usual, if you need any additional info or just want to say “Hi”, leave a comment below! Hi! We are a couple from Leeds. We were staying in Barcelona for a week, so we decided to visit Sitges on Wednesday. We went by train. It was cheap and comfortable. Happily, we were given a leaflet with some information on a ‘sitges free tour’ that was about to start, so we gave it a try. It was a very small group, but the guide was very good. He knew what he was talking about, and was funny as well. We loved the medieval streets and the many legends he explained. The guide had a green umbrella, and was fluent in English. Great experience! Awesome, thanks so much for the info!